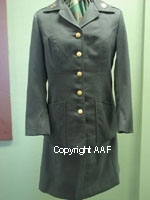 1980 dated, US Army, "Jacket, Woman's Gabardine, Army Green 344," belonging to a Woman's Army Corps. ("WAC"), woman, Private, serving in the Medical branch in the 82nd Airborne Division. 1988 dated, US Army, "Coat, Woman's, Poly/Wool Serge, AG-344, Classic Design" belonging to a Woman, Private, serving in the Medical Corps., of the 82nd Airborne Division 1930's Period, U.S., Woman's, Off White Color, Corset 1988 Dated, Desert Storm Period, US Army, "Coat, Woman's, Classic Design, Poly/Wool", Belonging To A WAC Woman, Specialist 4, Serving In The 7th Medical Command 1963 dated, US Navy, WAVE, Woman's Service Dress Uniform, belonging to Lieutenant Commander "E. Lindgren"